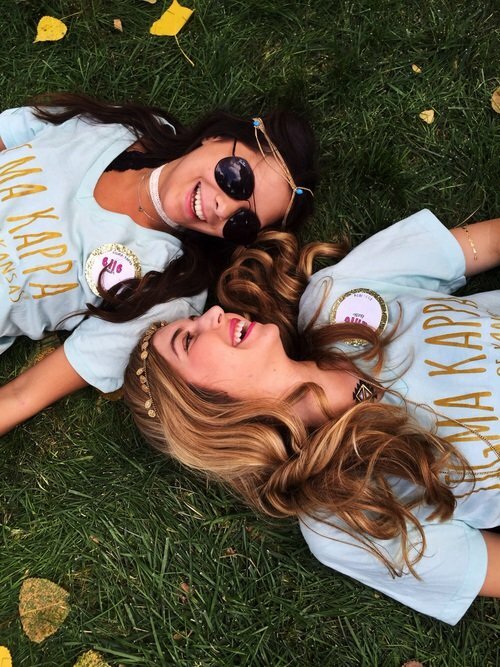 If you’re preparing for college this fall, it’s more than likely that you’ve started to think about going through sorority recruitment. If no one in your family was Greek, it’s entirely possible that you’re completely overwhelmed when you think about recruitment. Luckily, we have a team of experts here to answer any questions you have about what to expect before you start rushing. This comprehensive guide to rush will have you more than ready for anything. All questions were provided by Emma Ehlers, an incoming freshman who’s preparing for recruitment. Hayley Lollar is a recent graduate of Kansas State University and a proud member of Kappa Delta Sorority. She was her chapter president and the vice-president of public relations. Margaret Abrams is a former member of Kappa Alpha Theta at Tulane University. She served as her sorority’s assistant membership chair and vice president of administration. She has also written about sorority life for websites including Total Sorority Move, xoJane, and Racked. Brooke Stafford will be a junior at Penn State University this coming fall. She’s currently the marketing chair for Alpha Xi Delta. 1. Do I need recommendation letters? HL: Most sororities accept recommendation letters but they are not required. However, it doesn’t hurt to have them. If there’s a specific chapter you’re more interested in than others, having multiple letters of recommendation sent to them will show your interest before you get there. It also depends on where you will be going through recruitment. I only had one recommendation letter sent when I went through recruitment and it wasn’t to the chapter I joined. MA: If you’re going through rush at a Southern school I would definitely recommend having letters of rec for the sororities you’re most interested in. The girls on the recruitment board will know who you are in advance and be sure to look out for you. Ask your mom’s friends and women in organizations you’re in, because you never know who was Greek. It’s basically giving yourself a boost before you even get to the first sorority house. 2. What’s the process of recruitment week? HL: The recruitment process varies from campus to campus. Some campuses hold recruitment the week before school starts, others hold recruitment the first week of school. If you’re attending a university with deferred recruitment, that means their formal recruitment is in the spring semester. At Kansas State, we hold recruitment the week before classes begin and we kick off the fun with orientation. This is when the PNMs (potential new members) are split into groups and introduced to their recruitment guide. Your recruitment guide is your go-to person for any recruitment questions or fears throughout the week. There are four rounds during the week; open house, philanthropy day, sisterhood/house tour day and preference day. Each day you learn more about the chapters you are invited back to and they learn more about you. The conversations at the end of the week are much deeper and meaningful than those first day conversations. The system is based on mutual selection so throughout the week you will rate the chapters you liked the best and they will be doing the same with the PNMs they meet. You will start the week by visiting every chapter during open house, and will go to less chapters each day, until finally selecting your top choices and waiting to see what is on your bid card. I frequently hear that recruitment is stressful and exhausting. Making your selections each night may come with some stress and it does get tiring talking to so many people each day, but as long as you are being authentic and listening to your heart, you can’t lose! MA: My school had second semester recruitment, so it didn’t start until after winter break. This meant that you had an entire semester to get to know the girls. That’s why letters of rec were so important — older girls in sororities would make an effort to meet you before formal recruitment started. BS: At Penn State, rush week is broken down into Open Houses, First Rounds, Second Rounds, Preference Night and Bid Day. As you go through each round, you choose which sororities you like the best, and the sororities rate you. By the end of rush week, you’ll know what each sorority values, what each sorority’s philanthropy is, and what each sorority is known for. You’ll also be confident that the sorority you chose is the one you’re destined to be in. Rush week is definitely a whirlwind of emotional ups and downs, but it is worth it… I promise! HL: Bid day, oh bid day! Recruitment is my favorite time of year, and bid day is my favorite holiday! This is the day that PNMs find out which sorority they will become a part of. At K-State, we have bid night and bid day. The PNMs participate in the preference round of recruitment in the morning, have the afternoon off and reconvene at the union in the evening to receive their bid cards. Once all of the envelopes have been distributed, everyone opens their card at the same time and the new members run to their sorority. There’s always a lot of hugging, chanting, tears of joy and laughter. From there, each chapter has a bid night celebration at their chapter house and the next day they have a bid day activity. Last year, my chapter went to the zoo together! MA: Bid day is a ridiculous amount of fun, but if you don’t know anyone in your house it can get a little bit awkward. It’s completely fine to be overwhelmed. After all, you’re meeting 100+ new ladies who are suddenly your sisters. Take a deep breath, get to know everyone, and remember that soon these girls will be your best friends — no pressure. 4. Am I guaranteed a spot in a sorority? HL: No matter where you are going through recruitment, no one is guaranteed a bid. The purpose of recruitment is to determine the best match for the PNM and the chapter. Though every effort is made to extend offers to the maximum amount of women interested in Greek life, there are women who go through formal recruitment and do not receive a bid. If this happens, it does not have to be the end of your Greek life journey. However, it’s possible that Greek life IS for you, but the formal recruitment process wasn’t. Many chapters participate in continuous open bidding (COB) or informal recruitment. This happens when a sorority is under Panhellenic total and they have a spot(s) open. I know many girls who were overwhelmed during formal recruitment and didn’t get a bid. However, they were much more comfortable and relaxed during COB and found the chapter that was best for them. 5. What should I talk about at the parties during recruitment week? HL: The sorority women want to get to know you! I always say even if you aren’t sure about a certain chapter, go into every party with the goal to make a friend. The recruiter will lead the conversation but have an idea of things you want them to know about you and don’t be afraid to ask questions about them. MA: As long as you don’t talk about anything too controversial, you’re golden. That doesn’t mean you should be someone else or monitor what you say. At the end of the day, the older girls are having the same conversation over and over, so don’t feel like you have to talk about your dorm and classes. Talk about favorite TV shows or the funniest moments of freshman year. Just remember, you’re trying to make a connection, so it shouldn’t just feel like an interview. BS: Though it is usually the recruiter’s job to keep the conversation going, not all recruiters you talk to will have stellar communication skills. So, feel free to spice up your conversations with a few fun facts about yourself. Every sorority recruiter will love that you’re offering interesting information about yourself without them having to dig! Examples: Where you went on vacation; what your hobbies are; why you are rushing; what your favorite Netflix shows are; what kind of music you like; etc.